The complexity of the thin magnifying technology presents a barrier to copying the labels. In addition, customizable security layers are integrated into the labels including overt and covert microstructures, void features, and tamper evidence. 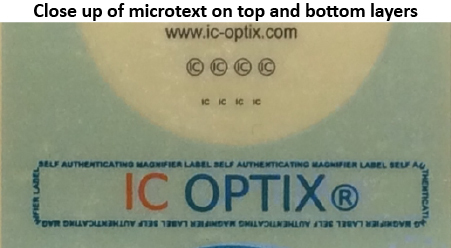 The “lock and key” feature of a label having microtext, as well as a lens to read the microtext, provides a new type of self-authenticating security label. 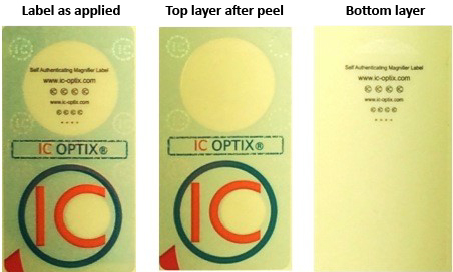 The images below illustrate an example of a self-authenticating tamper evident label where microtext on the bottom layer can be read using the lens on the top layer. In the example below two different focal length lenses are integrated into this label providing 3x magnification (open circle at top of label) and 6x magnification (the smaller clear circle within the C at the bottom part of the label). Diffractive microstructures can be seen at locations around the outside of the lens area.